I have a penchant for seeking out obscure adaptations of The Lord of the Rings, if you haven’t noticed. First was my quest to play every pre-film trilogy computer game remotely related to Tolkien’s work. 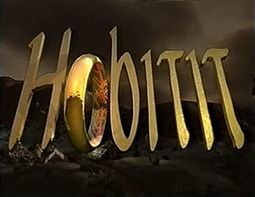 Then there was my long-time interest in a Finnish television series from 1993 called Hobitit (The Hobbits) based on The Lord of the Rings. I was first made aware of its existence back in The Tolkien Forum’s heyday, when one user made an offhand mention. Those were the days of my high school Tolkien obsession, so when I got wind of this, I just had to find it. There was a problem. The series aired on Finnish television all of two times, and was never released on VHS. Because of the huge cost of the license after Jackson’s films, it’s not likely we’ll ever see a DVD release. Thus, I immediately met with frustration on trying to find it, and once my willingness to hunt after these sorts of things wound down, I stopped looking. But never fear, the internet has come to the rescue and finally sated my curiosity: the entire series is now available on YouTube, complete with English subtitles. Would it live up to the mystique that slowly built over the years due to its rarity? Or would it be like the Soviet adaptation of The Hobbit (i.e. “What did I just WATCH”)? Warning, there be spoilers ahead. This review also assumes you’ve read the book, because hey, why else would you seek out an obscure Finnish adaptation like this? I’ve seen two bits of criticism of The Lord of the Rings pop up repeatedly on various forums, and thought they deserved a final response. Not only because I decided on doing some Tolkien defence today but because I’ve seen the same claims show up about various other recognized classics of somewhat higher pedigree than The Lord of the Rings and…guys, this needs to stop. Rules? What rules? I can pull any “write that novel” book off the shelf, or visit any writing blog, and the hard, unbendable rules will be different. Even widespread ones, like “show, don’t tell”, aren’t very helpful when you start thinking about them (surely to show something I’ve got to tell you about something else?). The rule “never start stories with dialogue” appears constantly, but guess which novel, often considered the greatest novel of all time, starts with dialogue? War and Peace. There are no set rules to writing novels. To take it further: There are no set rules to writing fiction besides those involving basic grammar, and writers can break those every once in a while too. There are helpful guidelines, sure, but just because a writer ignores Elmore Leonard’s rules of writin’ doesn’t automatically make that writer bad (in fact, Leonard’s rules are only useful if you want to write books like Elmore Leonard’s). I’ve questioned traditional rules of “good” writing before because, if you followed them to a “T”, you’d end up with fairly generic prose, the sort of stuff you’d read in any forgettable thriller/mystery/other piece of mass-market fiction. That doesn’t mean the prose, characters, and pacing of Tolkien’s work or other classics are above criticism; it’s fine to say why you personally found something clumsy, awkward, ill-defined, over-described, just don’t act like there’s an objective set of “rules” governing how to write a novel because there isn’t. Let’s get counter-factual, shall we? But this assumes that if Tolkien (or insert any other long-dead author in his place) wrote the novel today he would’ve written it in exactly the same manner, despite a much-changed cultural and literary environment. While I doubt Tolkien would’ve ended up with A Game of Thrones, I also don’t think 21st-century The Lord of the Rings would’ve looked exactly the same as the book we got. Next, this claim assumes that publishers are somehow more discerning what novels they publish now than they were in the 50s. The same contemporary publishers who’ve printed Eragon, Twilight, Modelland and 50 Shades of Gray, which are just so much better than *insert work by long-dead author here*. In other words, statement (2) is meaningless. Classics aren’t above criticism. But they are above petty, ill-considered criticism, just like any other work of fiction from whenever. You’re free to rip into The Lord of the Rings or Frankenstein or Crime and Punishment if you want, but please, put some thought into it first.